For other uses, see Heather Angel (disambiguation). Heather Grace Angel (9 February 1909 – 13 December 1986), born Heather Grace Angel, was a British actress. Angel was born 9 February 1909 in Headington, Oxford, England. In the 1911 UK Census, the family is shown as living at 17 Banbury Road, Oxford along with three servants. She was the younger of two sisters. And the daughter of Mary Letitia Stock and Andrea Angel, an Oxford University chemistry lecturer and initially a don at Brasenose College and later at Christ Church. They were married in 1904 and, after the wedding, they moved to the Banbury Road. Andrea Angel was killed in the Silvertown explosion in January 1917, and posthumously awarded the Edward Medal (First Class). In his Will, he left his wife £374 and shortly thereafter, his wife moved to London with the two daughters. By 1929, when Heather was 19, she was already appearing with an overseas touring theatre company managed by Charles Bradbury-Ingles. The same record shows that she was living at 20 Queen Anne's Grove, London W4, when she left. Angel began her stage career at the Old Vic in 1926 and later appeared with touring companies. Her Broadway debut came in December 1937, in Love of Women at the Golden Theatre. She also appeared in The Wookey (1941–42). Angel appeared in many British films. She made her first screen appearance in City of Song. She later had a leading role in Night in Montmartre (1931), and followed this success with The Hound of the Baskervilles (1932). She then decided to move to Hollywood. She sailed on the Majestic to New York on 21 December 1932 with her mother. Over the next few years, she played strong roles in such films as The Mystery of Edwin Drood (1935), The Three Musketeers (1935), The Informer (1935) and The Last of the Mohicans (1936). In 1937 she made the first of five appearances as Phyllis Clavering in the popular Bulldog Drummond series. She was cast as Kitty Bennett in Pride and Prejudice (1940) and as the maid, Ethel, in Suspicion (1941). Angel was also the leading lady in the first screen version of Raymond Chandler's The High Window, released in 1942 as Time to Kill. 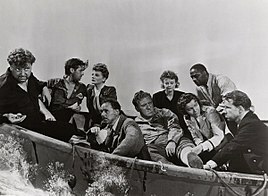 She was one of the passengers of Alfred Hitchcock's Lifeboat (1944). Her film appearances in the following years were few, but she returned to Hollywood to provide voices for the Walt Disney animated films Alice in Wonderland (1951) and Peter Pan (1953). From 1964 until 1965, she played a continuing role in the television soap opera Peyton Place. After that role, she played Miss Faversham, a nanny and female friend of Sebastian Cabot's character of Giles French in the situation comedy Family Affair. Angel married actor Ralph Forbes in Arizona in 1934, a union that lasted less than ten years. Angel had acted with Henry Wilcoxon in Self Made Lady (1932) when they were both in Britain. When she heard Wilcoxon was also in Hollywood, she contacted him. She invited him to polo matches at the home of Will Rogers and later taught him horseback riding. They acted together in two other films: The Last of the Mohicans (1936) and Lady Hamilton (1941). Though they remained lifelong friends, they never married. Heather and her husband were both present at the wedding of Wilcoxon to his first wife. They had intended to host the wedding at their house in Coldwater Canyon. Angel has a motion pictures star on the Hollywood Walk of Fame for her contributions to the film industry. Her star is located at 6301 Hollywood Boulevard. Angel died from cancer in Santa Barbara, California, and was buried in Santa Barbara Cemetery. ^ a b "Four Stars in Color". Chicago Tribune. 28 July 1940. Retrieved 15 October 2010. ^ "Minute Biographies – Heather Angel". Pittsburgh Post-Gazette. 30 October 1933. Retrieved 15 October 2010. ^ "Stage News". New York, Brooklyn. The Brooklyn Daily Eagle. 7 December 1937. p. 9. ^ "Heather Angel". Playbill Vault. Retrieved 21 December 2015. ^ a b c "Heather Angel, 77, Is Dead; Acted in More Than 60 Films". The New York Times. 16 December 1986. Retrieved 15 October 2010. ^ "RETIRED DIRECTOR IS SLAIN ON COAST; Robert Sinclair Is Stabbed in Home Suspect Held". The New York Times. 5 January 1970. Retrieved 15 October 2010. ^ "Heather Angel". Hollywood Walk of Fame. Retrieved 21 December 2015. Wilcoxon, Henry; Orrison, Katherine (1991). Lionheart in Hollywood: the autobiography of Henry Wilcoxon. Metuchen, NJ and London: The Scarecrow Press, Inc. ISBN 0-8108-2476-0. Wikimedia Commons has media related to Heather Angel. This page was last edited on 18 April 2019, at 21:38 (UTC).